While most dog bites do not even break the skin, a small percentage cause severe or even irreparable physical and psychological damage. In fact, Florida has the second highest number of dog attacks in the nation. If you or a loved one was injured by a dog, you may be able to collect compensation to help alleviate the immense financial burden that has been placed upon you. In Florida, a dog does not need to have a history of aggression for its owner to be held liable upon a first-time attack. To find out more, contact a West Palm Beach personal injury attorney today. Pursuant to Florida Statute §767.04, a dog owner is liable for another person’s injury when that person is either on public property or lawfully on private property, “regardless of the former viciousness of the dog or the owners’ knowledge of such viciousness. If the victim was found to be partially negligent for causing the attack, such as provoking the dog or kicking the dog, liability will be split according to the percent that each party is found negligent. For example, if the victim taunted the dog and the dog bit the person, causing a laceration that needed to be stitched, the victim may be held 20 percent liable, meaning that they would only receive 80 percent of what the claim is worth. More than one-third of homeowner liability claims in 2016 were those of dog bites and dog attacks, amounting to over $600 million. Florida had the second highest number of dog bite homeowner claims in 2016 out of all 50 states, totaling 1,321. 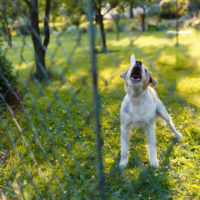 In fact, the number of homeowner liability dog bite claims rose by 18 percent across the country last year, according to the Daily Report. However, the average claim, which was $33,230, dropped by 10 percent from 2015 to 2016. While the decrease in claim amount was less than the previous year, from 2003 to 2016, the average claim amount has actually risen by over 70 percent. The reason that claim amounts are growing at such a fast rate is due to the rapidly rising cost of medical care. Even a moderate dog bite wound can easily cost tens of thousands of dollars, while more serious injuries can amount to hundreds of thousands or even millions of dollars if the attack was particularly vicious. However, be aware that most homeowner’s insurance policies exclude coverage for dog bites, but many dog owners pay for “riders,” which cover dog bites in their homeowner’s policies. Whether you, your child, or another loved one was injured by another party’s dog, you need legal representation at once. Call the West Palm Beach attorneys of the Celeste Law Firm today at 561-478-2447.